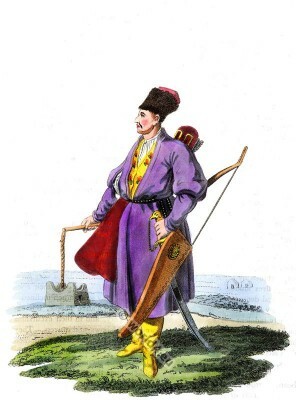 Home » An armed Turcoman, with his Bow 1803. Un Turcoman armé de son Arc, &c.
THE Trukhmenes, or Turcomans, says Professor Pallas, are a wealthy, well-formed, lively people, and more attached to ornamental dress than any other tribe of the Steppes. They are by no means to be compared with their brethren who inhabit the eastern shore of the Caspian sea. These people are independent, but poor and uncivilized; while the other Trukhmenes have, under their present political constitution, improved much in comeliness and gaiety. Before the Kalmucs took possession of the Steppe of the Volga, they subjected these very people, made them tributary, and compelled them to migrate over the Yaik. Here they, became subject to the Khans of ‘Forgot, who, however, granted them the free exercise of the Mahometan religion. On the retreat of this horde from the Steppe, the Turco-mans rose in arms, refused to accompany their fugitive oppressors, and became vassals to Russia. They have since been removed to the Steppe of Kislar, where they are permitted to lead a wandering life, with their flocks and herds, between the Kuma and the Terek. They have a great number of camels, cattle, sheep, and horses. Their horses resemble the English breed, and are much superior to the lean and narrow-chested horses of the Kalmucs. They dwell in felt tents exactly similar to those of the Kalmucs; and their only fuel is dried cow-dung and rushes. Their principal food is flesh, sour milk, a small quantity of groats and meal, which they purchase of the Russians; but their favourite food is horse-flesh. These people appear to lead a tranquil life; being obliged to perform no other services than to furnish post-horses, and to do military duty. They are governed by a particular magistrate, called Pristaf who has a very good place, lives among them with several interpreters, watches over their con-duct, and determines all their disputes; to which they seem much inclined. They are a lively, polite, officious, and communicative people, but extremely indolent. They are very expert in archery, and in their excursions on horseback are usually armed with ornamented bows and quivers. They have rich belts and sabres, and are fond of crimson-coloured dresses, adorned with lace. Their caps are generally round, and trimmed with black lamb-skins, similar to those of the Poles. They shave their heads quite bare, and many of them also shave their whiskers; but the old men allow their beard to grow under the chin. The dress of their women and girls exactly resembles that of the Nogais; and .the married women also wear a ring in one of the nostrils, as is customary among the female Tartars of Astrakhan. This entry was posted in 1803, 19th Century, Asia, Caucasia, Russia, Turkey Costumes and tagged Edward Harding, Russian national costumes on 11/12/14 by world4.